An 8oz. cup of coffee has 80mg to 150 mg of caffeine vs. 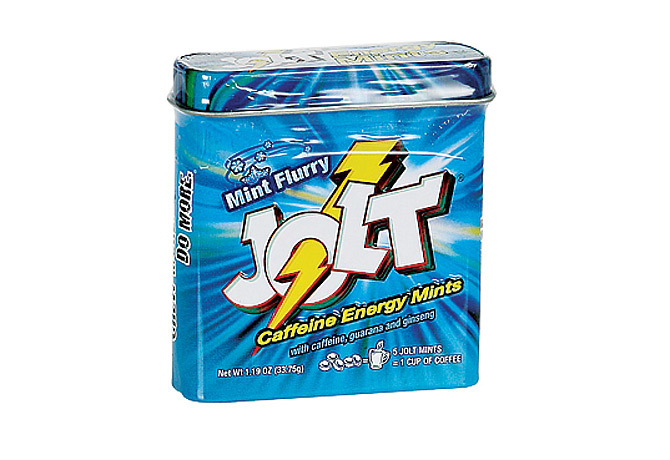 Jolt mints has 30mg per mint. There are more than 170 million addicts in the U.S., and odds are you're one of them. You consume your drug of choice every day; you'd feel ill if you couldn't have it; you'd have a hard time quitting it. The chemical that has you hooked, of course, is caffeine, and if you think you get it only in coffee, tea, cola andin smaller doseschocolate, you haven't been paying attention. Food manufacturers recognize a hot market when they see it, and with anywhere from 55% to 90% of the U.S. population consuming caffeine every day, depending on the study, the stuff is now turning up everywhere. Red Bull energy drink may have the highest profile of the new caffeine-spiked products, but at every turn there are others: caffeine-infused gum, lip balm, mints, beer, candy, sunflower seeds, even soapwhich is supposed to provide its caffeine boost through the skin. Then too there is a product called Blow, a white caffeine-based powder appallingly marketed in vials. It's meant to be stirred into water or other drinks, not snorted, but what it evokes is unmistakable. Meantime, a number of products that were already caffeinated, including Diet Pepsi and some brands of coffee, are offering higher-octane formulations with an extra dose of caffeine. Judging by the cash registers, consumers couldn't be happier. Sales of all caffeinated drinks went up more than 55% last year, according to the industry publication Beverage Digest. What pleases the public, however, may displease doctors. I decided to take a look at just how dangerous all this caffeine may be. Regular doses of caffeine have been the subject of countless medical studies. We know the substance effortlessly crosses the blood-brain barrier, creating swift and rewarding effects. Caffeine works by dampening neurotransmitters that would normally make you sleepy, improvingtemporarilycognitive function and even athletic performance. In fact, U.S. military nutritionists recommend an occasional 100 mg to 600 mg for fighter pilots and soldiers when they need an extra boost to stay awake. The typical consumer drinks about 200 mg to 300 mg a day in the form of two to three cups of coffee. But how much is too much? "Exactly what level of caffeine is harmful is not clearly established, but generally more than five [8 oz., or 240 mL] cups of coffee is too much," says physiologist Harris Lieberman of the U.S. Army Research Institute of Environmental Medicine, who has been studying the effects of caffeine for more than 20 years. Energy drinks pose particular problems because they vary wildly in how much caffeine they contain. While the typical cup of coffee has 80 mg to 150 mg and soft drinks have 34 mg to 50 mg per can, energy drinks may pack from 75 mg to 300 mg per serving. It's technically possible to die from a caffeine overdose, but, says Dr. Eric Lavonas, a North Carolina emergency-room doctor and a spokesman for the American College of Emergency Physicians, "you have to really work at it." Far more common are people who simply fall ill from eating or drinking too much of the stuff. In 2000 presidential candidate Bill Bradley attributed his irregular heartbeat to caffeine consumption. He had quit drinking caffeine four years earlier and blamed the episode on a single caffeinated cream soda. But such effects are unusual, according to Lavonas. "In almost all cases," he says, "your body will tell you to stop before it gets dangerous." The jitters and stomachaches are the most common symptoms of taking in too much caffeine. Worse, to hear many caffeine addicts tell it, is the way you feel when you stop suddenly. Withdrawal symptoms include headaches, fatigue, jitteriness, nausea, diarrhea and tremors. Other side effects of withdrawal include palpitations, sleeplessness and cramps. In a country of caffeine addicts, it's unlikely that you'll ever develop a serious problem, and there aren't any rehab centers for coffee dependence. So the best advice is to know your limits. The highest caffeine boost can be felt one hour following ingestion, but significant effects can last for eight hours. If you're at risk for heart disease, hypertension or digestive disorders, talk to your doctor about how much caffeineif anyyou should be drinking. Like any pleasurable substance, caffeine can be abused. So enjoybut with care.